I do not get The Wicked + the Divine. I mean, I like it. I like it a lot. I look forward to each new issue and I'm always interested to see where the story is going, but I do not understand it even a little bit. I think - and this is just my analysis as far as I can make it - but I think that the series is supposed to be about fame and celebrity and the idea of having all the power in the world and none of it at the exact same time. Then again, I could be totally wrong. I have no idea. 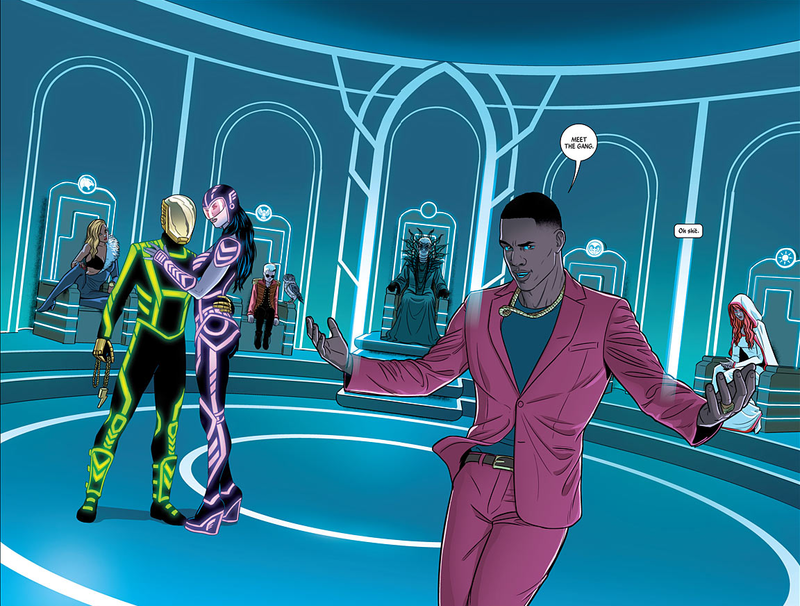 And that, to be totally honest, is part of why I like The Wicked + the Divine so much. I don't get it. I can only glimpse the themes of what's going on dimly through a window far away, and that's kind of satisfying. It's a joke that movie critics over time start to like weirder and weirder crap just because they can't predict where it's going, but it's also kind of true. While I still love my Ms. Marvel and Squirrel Girl and Silk comics, I also really enjoy this one if only because it tells a compelling story that is complex enough to require multiple readings. Not only that, but it's a story that embraces non-linearity and a very loose story structure. In a world ruled by the kind of plotting you usually find in a two hour film, this is refreshing. 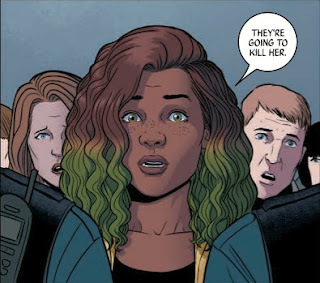 The Wicked + the Divine meanders all over the place, showing beautiful pictures and being vaguely unsettling, but never really getting to the point, which is a lot of its charm. As for what it's actually about, well, I'm not sure I can tell you. But I'll try. The Wicked + the Divine is a monthly comic published by IMAGE. 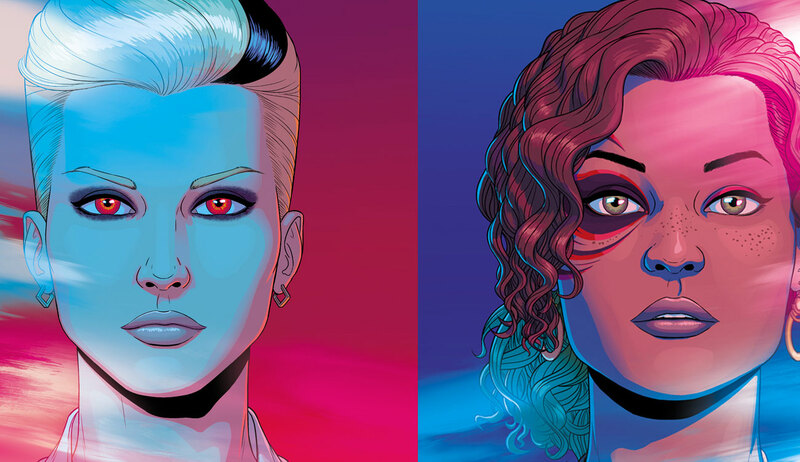 It's written by Kieron Gillen with art by Jamie McKelvie. It's a genre mixup of mythology and fantasy with modern day rock bands. Basically, the premise is this: "Every ninety years, twelve gods incarnate as humans. They are loved. They are hated. In two years, they are dead." The gods come down and immediately become the most known people on the planet, and in our day of super celebrity stardom, that's saying something. The world of WicDiv (as it's fondly called) is messed the hell up, with gods giving concerts that result in mass orgasms, the "Pantheon" appearing as a roving convention where the faithful can pay a hundred dollars for a picture with their favorite deity, and at the center a bunch of scared teenagers who know they're going to die before they get old. The gods themselves are the heart of the story. Though not exclusively teenagers, they are all young, attractive people who have to deal with their lives being summarily over. As one of the comic's arcs shows, being a god isn't all it's cracked up to be. People love you, but only because you're a god. This is aptly shown when the goddess Tara tests her followers by putting on a mask and singing the music she was working on before she came into her power. The reaction from her audience? Rage that she would try to pretend her human side has any value. Lucifer is framed for murder. Weird, I know, to think of the devil protesting her innocence, but it's true. Laura is positive that Lucifer didn't kill the man. Even worse, before Lucifer can escape she too is killed, seemingly the same way (her head explodes). Laura decides that she has to find out who framed Lucifer and killed her, even if they kill Laura too. Unfortunately, since all of Laura's suspects are also gods, it's pretty hard for her to figure this out. No one really liked Lucifer but no one really hated her either. As Laura investigates, though, we get to meet the whole Pantheon and discover some really unsettling trends. Like, not only is the whole Pantheon really really young, they're also predominantly made up of people who had a bad home life or don't have a home to go back to. With the exception of Minerva, who absolutely gets the worst deal, the gods of the Pantheon are a bunch of scared kids just trying to screw themselves into not thinking about how soon they're going to die. Their only authority figure, the only person they trust to sort them out, is the one person who's actually got a reason to kill them: Ananke. Ananke is sort of one of the gods and sort of not. She's an elderly woman who basically exists as the precursor to the gods. I'm reasonably sure that instead of dying and reviving every two years, Ananke just continues to exist the whole time, which means that there are long swatches when she is the only god alive and yet no one can know who she is. According to Ananke, the dying-reviving cycle exists so that the old darkness is kept at bay. The gods shine brightly and flash out to strike out at the darkness and keep humanity safe. But when the gods die, there isn't as much light and the darkness gets closer to winning. 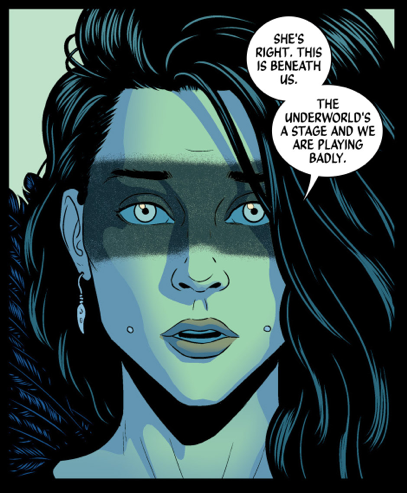 Which is why it's a pretty big betrayal when we realize that the person who killed Lucifer, and who's killed the other gods too, is none other than Ananke. Laura finds out, much to her peril, when Ananke realizes that she is actually the reincarnation of Persephone, a god who doesn't come out much. Ananke's immediate reaction to this information? Blowing Laura's head off. It seems that somewhere in those long years of loneliness, Ananke went insane and decided it was better to let the darkness win. Maybe. That's the thing - I'm really not sure. For all that this series is easy to follow, it's also very inscrutable. I know very little about what Ananke's actual motivations are, and the only character whose heart we really grew to know (Laura) is now dead. It's complicated. But, like I said above, that's really what I like about The Wicked + the Divine. I like that it's complex and hard to figure out and that the story might be going nowhere at all. While it's telling me a story, it's also expanding a discussion of celebrity culture. I find the philosophical stuff going on behind the scenes really interesting, not to mention how cool the worldbuilding is. I mean, there's just something so fascinating about a world in which deism is treated like an aggrandized form of celebrity. I think it resonates because it's based on truth, but that the truth is the other way around. We idolize celebrities as replacements for gods, not vice versa. So putting gods in situations like celebrities is genius. It posits the idea of this is what it would mean for a god to appear now. This is who we are as people. It's a dismal view, but an interesting one. 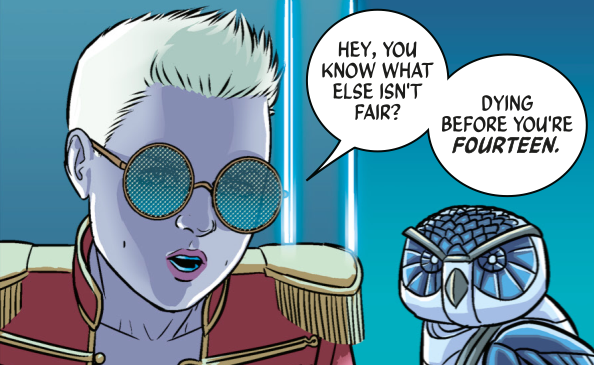 And I do have to say that I really like the way WicDiv is written. There's a lot of emphasis on racial and gender parity in the gods, even when such "colorblind casting" doesn't make sense. Like, there's a whole thing about how Amaterasu, a Japanese trickster spirit, has reincarnated into a privileged white girl. Cassandra, who is of Japanese descent, chides her for being culturally insensitive. And that's honestly a really good question. Is that okay? I mean, all the gods are a mush of cultures and races and that's super cool, but what about the gods of cultures that have been traditionally held down by white people? Is it then really feasible for these gods to have reincarnated into white children? I don't have answers to these questions, mostly because they're the kind of world-specific questions about discrimination that are the most interesting to me, but I love that WicDiv asks them. Still, I honestly can't give a good reason for why I like this silly comic so much. It's not like Saga where I think it's genuinely saying something profound, or like Lazarus where the story can get clunky but the morals are on point, or even like Rat Queens where I just enjoy the hell out of it because it's really funny. The Wicked + the Divine is a challenge, and I guess I just enjoy the work of wondering if I'm ever going to get any answers. I don't mean to discourage all of you from reading this comic by any means, by the way, I guess I just needed to think this through for myself. Meandering plots and intentionally avant-garde storytelling aren't usually my thing, so I'm a little surprised I even got into this book in the first place. Maybe it was seeing Laura's face on the first cover. Maybe it was the sheer insanity of the plot. Maybe it was just curiosity about where it would go next. Whatever the reason, I've stuck with it. The art is beautiful, the writing is compelling if ineffable, and the comic itself is worth a shot. But don't feel bad if you have no idea what's supposed to be going on. And if you do figure it out, please, please, please tell me. *Minerva was twelve upon receiving her godhood. She will die before she turns fifteen. That's horrible. Plus side, her parents seem pretty cool about helping her through it and keeping her safe, but seriously. That's just awful. It was pleasure to read this awesome post.